I’ve recently left behind my Skype headphones for the ease of use and reliability of Jajah. 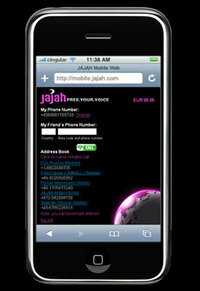 <– I see that Jajah have now released an “iPhone friendly” version of their service here. Because Jajah is inherently a web app, and not a local client like Skype, this could put them streets ahead of the competition. Plus, there’s the added benefit that jajah call quality is pretty high in my experience.. If you haven’t tried jajah, give it a whirl. If you have an iPhone, enjoy your new found call freedom. P.S. Any tips on how can I get my hands on an iPhone?! Have you thought about relocating to Cupertino and joining Apple? All Apple employees get an iPhone. Oops I guess I shouldn’t have sold the one I brought back last week from the states so fast.. but 100% markup is hard to beat. thanks a lot for the article and support, highly appreciated. I just send you an email too. Thanks a lot and get back to me if you have any further questions or feedback.